This is a two weekly reusable contact lens that has proven to be one of the most comfortable reusable contact lenses on the market. It uses HYDRACLEAR® PLUS Technology which allows 98% of available oxygen to reach the eye due to its silicone hydrogel form. The lens is lubricated by a wetting agent that is embedded into the lens whilst mimicking mucins (of the natural tear film) to help maintain a stable tear film. Many patients say that they are unaware of the lens in their eye at all. I find this lens especially useful for patients who wear lenses for many hours a day or for those who work in air-conditioned environments or in front of a computer screen all day. This lens comes in powers between -12.00 and +8.00. You can choose between a base curve of 8.4 mm or 8.8 mm. Its diameter is 14.00 mm. Therefore, this lens fits most patients very well and the large range of powers is a clear advantage. Like all Johnson & Johnson lenses it comes with UV protection. 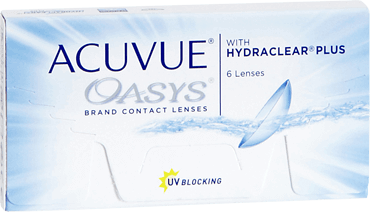 Acuvue Oasys lenses have Class 1 UV protection which blocks 99.9% of UVB and 96.9% of UVA. Patients should still use sunglasses as the lens only protects the cornea from UV and not the rest of the eye. NOTE: This lens is so breathable that it’s actually licensed to be slept in for one entire week. Patients should take the lens out on the seventh day so that the eye can rest. A new lens can then be used on day one of the following week. 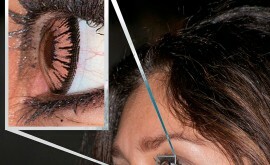 During this time patients should not sleep with the lens in only some nights as this increases the risk of infection. 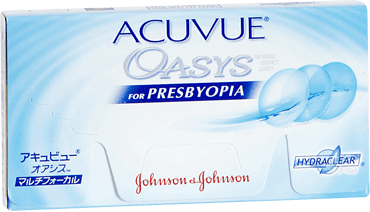 This is a two weekly reusable contact lens and like the Acuvue Oasys spherical monthly lens, it has proven to be one of the most comfortable reusable contact lenses on the market. It uses the HYDRACLEAR® PLUS & BLINK STABILIZED™ Technology. The Hydraclear Plus Technology allows 98% of available oxygen to reach the eye due to its silicone hydrogel material. The lens is lubricated by a wetting agent that is embedded into it and which mimics mucins (of the natural tear film) to help maintain a stable tear film. 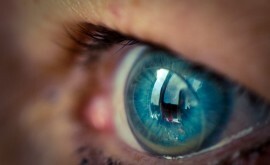 Many patients say that they are unaware of the lens in their eye at all. The BLINK STABILIZED™ Technology works by utilising four stabilisation zones which allow for the natural blink of the eye. In turn this enables the visual acuity to be consistently clear on every blink. This lens comes in powers between -9.00 and +6.00 and is one of the few silicone hydrogel reusable lenses that correct astigmatism of up to -2.75DC. It comes in a base curve of 8.6 mm and a diameter of 14.5 mm. Like all Johnson & Johnson lenses it comes with UV protection. 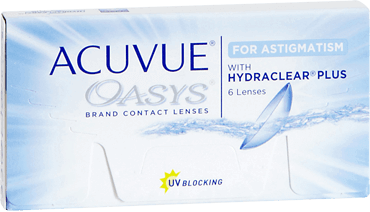 Acuvue Oasys for astigmatism lenses have Class 1 UV protection which blocks 99.9% of UVB and 96.9% of UVA. Patients should still use sunglasses as the lens only protects the cornea from UV and not the rest of the eye. This lens is a two weekly reusable contact lens that uses STEREO PRECISION TECHNOLOGY™ for its multifocal design and HYDRACLEAR® PLUS Technology to ensure comfort. 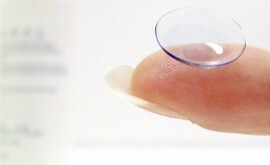 The lens is based on the silicone hydrogel material senofilcon A. The Stereo Precision Technology works by adding asphericity to the lens back surface and within each individual concentric ring. Vistakon also claim that the lens is designed to work ‘with the eye’s natural depth of focus’. It is available in powers between -9.00 and +6.00 with reading prescriptions in a low- (up to +1.50 D), mid- (to +1.75 D), and high- (+2.00 D and higher) add design. It comes in a base curve of 8.4 mm and a diameter of 14.3 mm. I have to admit, that previous problems such as ghosting and blurring in different light conditions have proved much less with this lens design.